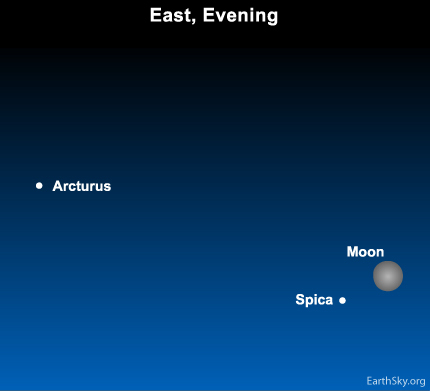 Tonight, the waning gibbous moon beams near two bright and beautiful stars, Arcturus and Spica. Sparkling above the eastern horizon at early to mid evening, these stars travel westward (along with the moon) throughout the night, and stand high in your southern sky in the wee hours after midnight. As dawn starts to color the sky, these gems light up the western sky. In early spring, these two springtime stars shine all night long. Although yellow-orange Arcturus appears much brighter than blue-white Spica to our eye, that is only because Spica is so much farther away from us. Arcturus resides about 37 light-years away, whereas Spica lies some 7 times farther off than that, at 260 light-years distant. If Arcturus stood at the sun’s distance from us, it would shine over 100 times more brightly than the sun. 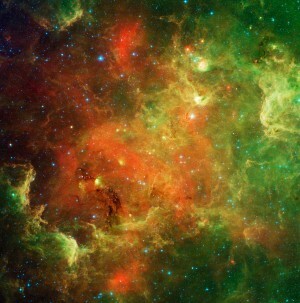 However, Spica at the sun’s distance away would shine with the firepower of over 2,000 suns! Unlike the fickle moon, the Big Dipper guides you to these springtime stars, Arcturus and Spica, with the utmost faithfulness. At nightfall, the Big Dipper stands on its handle in your northeast sky, and it looks to me like a kite flying in the March wind. Site contents copyright © 2019 Recorder Online	except as noted. All rights reserved. | 90 queries in 2.083 seconds.